This bulletin covers the following Champion Power Equipment models: All Champion Power Equipment models instilled with a 717cc or 754cc engine. Please read all the instructions carefully before performing this service. 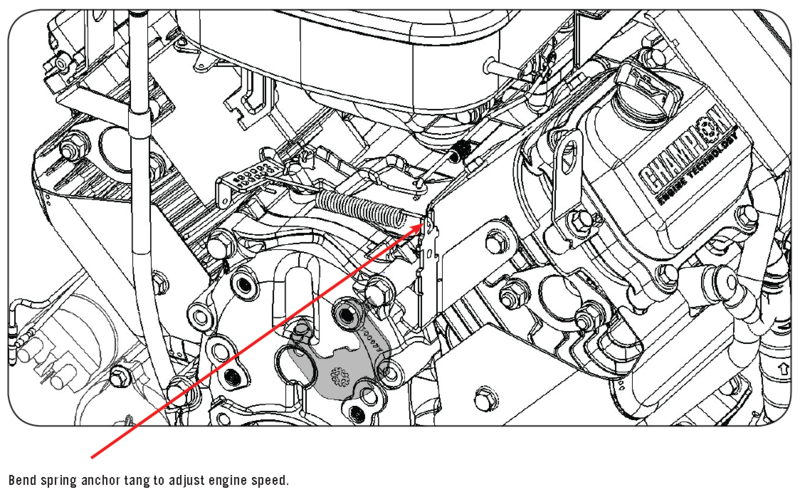 Engine speed is normally set to 3750 RPM (62.5 Hz) high speed to no load (HSNL). Set engine speed with no electrical load on the generator. To increase the engine speed HSNL, bend the spring anchor tang on the fixed speed controls away from the governor lever to increase the spring tension. To decrease engine speed HSNL, bend the spring anchor tang on the fixed speed controls toward the governor lever to decrease spring tension.